­Egypt still depends on billions of dollars of US aid, so it was predictable that Morsi would turn up at the Non-Aligned Movement (NAM) summit and denounce Syria, Clark said. Morsi’s controversial remarks prompted members of the Syrian delegation to walk out on the speech in protest. Clark spoke with RT about the consequences of Morsi’s statement. RT: Syria’s foreign minister has said that Morsi’s comments amount to inciting further violence in the country. What do you think? Neil Clark: The problem I have with the speech is that it was so imbalanced. He didn’t criticize the rebels at all. The rebels have been responsible for much of the violence in Syria. The government too – that’s fair enough. But there were bombs going off this week at funerals, with 12 people killed, and he didn’t make any mention of that. So I can understand the Syrians feeling very aggrieved by what he said. RT: Morsi would have foreseen that his statement, however accurate or inaccurate, would have angered Syrians and the hosts of the summit. What do you think his motivation was here? NC: We’ve got to bear in mind the fact that Egypt receives about $1.56 billion US in aid. On top of that, back in August, they received $2 billion from Qatar. And of course, the US and Qatar are two of the leading hawks on Syria. So when you’re receiving that much money from the US and Qatar, it’s hardly surprising for Egypt to turn up at the summit and criticize Syria. RT: The new Egyptian leader Mohammed Morsi is perhaps already signaling his friendship with the West, or possibly with Capitol Hill. Do you think the 120 member-states attending the summit can come up with a way to resolve the ongoing crisis in Syria? NC: The key player in this is the US. Unless we get a change of position from the US and its allies, I don’t see what the NAM movement can actually do. I think the ball is in America’s court, and all we’re getting from Washington is more right-wing rhetoric about arming rebels. So unless we get a major shift, it’s not going to help. And I’m afraid Egypt’s position isn’t helping at all. RT: Mohammed Morsi appears to be on friendly terms with Iran, China, Israel and the US. There had been a talk of a possible geo-political shift in the Middle East. But do you think we can really take this new Egyptian leader at face value? NC: I don’t think we can. I think people who are expecting a shift will be disappointed because of the financial hold that the US has over him. He’s trying to be all things to all people. He’s trying to be friendly with Israel and Iran. It doesn’t work. You have to make a choice and make a stand. If he wants to support the Palestinian people, then he can’t be friends with the current Israeli regime. RT: Do you think Morsi was trying to undermine the summit with his comment? Even Ban Ki-moon, who attended the summit against the US and Israel’s wishes, hasn’t said anything as harsh as what Morsi said. NC: Absolutely. I think it’s all part of the plan to go there and sabotage the summit. A lot of people were very naïve about Egypt. They thought there was going to be a meaningful change in Egypt’s foreign policy after what happened last year, but it’s continuing. It’s more of the same. I think that’s part of the game. The US will be very pleased with what Morsi said. RT: Some possible plans have been put on the table to resolve the crisis in Syria – both Egypt and Iran have put forward plans to form mediator groups. Morsi suggests involving Egypt, Iran, Turkey and Saudi Arabia. Ahmadinejiad suggests Egypt, Iran and Venezuela. Which one do you fancy the most? NC: Well, if you look at the first choice, you’ve got three countries – Saudi Arabia, Egypt, and Turkey – who actually want regime change in Syria, so they don’t want a peaceful, compromise solution. So I don’t think anything involving Saudi Arabia or Turkey is in the cards. The second option is better, but it doesn’t matter what mediator groups we set up. The key player in all this is the US. The US has to change its policies and allow Syrians to sort out their own futures and back out of Syria. Then we can get some peace and dialogue. RT: Washington has said the Non-Aligned Movement Summit isn’t worthy of any high-level attendance. Do you think such criticism is justified? NC: It’s two-thirds of the world and the US has the arrogance to say it doesn’t count. The US wants us to believe that only it and its allies represent the international community. 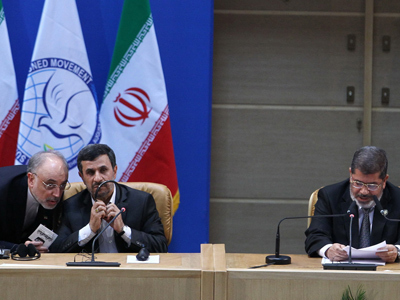 The international community is meeting now in Tehran and the US doesn’t like it. The fact is that the US is getting more isolated on a series of issues. South America, African countries, China, Russia: That is the world and I think we’re going to see more of a shift in years to come. And the US power is in decline – that’s the reality. And that’s what they don’t like.